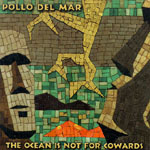 San Francisco's Pollo Del Mar have just issued their first CD. The y have definite Zappa influences, a wonderful and unique sense of melody, and plenty of watery underpinnings. The music is loaded with jazz and desert and island shimmer and unique melodies. There is just no one out there doing what they are doing. Sophisticated writing, hot performing, and unusual combinations of elements bring it all together for a unique trip down the highway of instrumental hugeness. A great band. Ferenc Dobronyi is the main man, writer, and lead guitar masher, Jono (Juano Kahones) Jones carries the exceptional rhythm guitar, Jefferson Turner does the bassisms, and Chris Thomas whacks the drums. Pollo Del Marvelous! Among my favorite bands occupying the suburbs of surf, Pollo Del Mar deliver a wonderful Zappa-esq jazzy tune dripping in desert visions and surfy soundtrack possibilities. There are no other bands doing what their doing. They have a unique niche in the surf world. melodic and off beat themes are the norm for this most arty of surf bands. This track is really cool. It has a rolling beat and shimmering twang. More "surfy" than most PDM tracks, this has a pretty trad melody and structure. It is very infectious, and I suspect it will endure in your collection. The sax adds an extra bonus, creating even more surf ethos. Very cool! Slow sinewy melody line over a nice counter melody and soothing rhythm section. It beckons like a small island off Baja on a war spring afternoon while the waves gently lick at the shore. Imagery... yes! Very pretty song. Among the best in the set. Way short bit of near flick fluff to tease... very cool and shimmery... what it does is intro "The Whammy." They play as a set. Infectious rhythmic off beat and intellectually sound. I sure like what's going on here. Great band - great track. Many nifty changes, bits of a half dozen different genres... a must. Howling feedback opens into distorto fuzzmaster lead and Amon Duul II "La Paloma" rhythm guitar. Edgy, dissonant, and accented with an alternative break style that brings the whole thing together. Completely unlike the rest of the CD.